Yikes. I just got back in from chasing the dogs. They had gotten hold of a bag of garbage I had thrown out on the porch while I nuked my coffee and used the ladies room. Seeing the missing bag, I dashed out without a coat and in slippers screaming my fool head off..now my fingers are FROZEN…and as such, I just about forgot to type an "o" in the title above. Some days are just like that! It may have been that "hello-sans o" has frozen over out there today? Here's a quick card that I whipped up yesterday, while I myself, was trying to quiet my racing mind. I find stamping/crafting is good for all that chatter in my head. (perhaps Ella isn't the ONLY one needing therapy?) 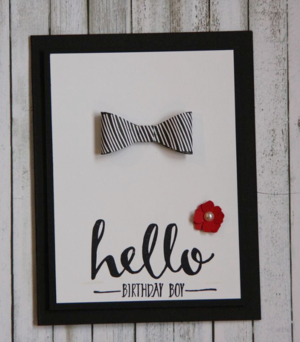 This uses the "Hello" stamp set that is retiring in a few short days! Isn't this just the cutest? You need to place your order by Feb 15th to get this adorable stamp set! It's pretty fun! I thought it was kinda cute. Sort of reminded me of a handsome fella in a tuxedo and I will have to say the few times I've seen my guy in a tuxedo, he's been adorable. He's also had a flower pinned to his lapel…and these few times were all around 25 years ago. Perhaps the time will come again, when he'll be in an another tux, as we do have three children and hopefully at least one will find a special friend to spend their lives with. :) but for now…he's more of the camouflage and jeans kind of guy.